Lucy Combs and the University of Kentucky were intertwined like few others have ever been -- or will ever be. Lucy was an alum of UK, and she worked for the university for 45 dedicated years. Lucy was a constant in the Department of English for most of that time, a true rock for all those that needed to lean on her for every conceivable form of information and knowledge, and she shared that wisdom graciously. Below are some thoughts and memories from those who knew her. I walked into Patterson Office Tower for the first time in 1989 and Lucy instantly became my compass for the next 22 years. Her smile lit the way but her extraordinary generosity and tireless devotion to my random neophyte questions always made my day better. Her work ethic informed me. Her kindness was never compromised. She taught me so much about being at UK, essential things that I needed to know in order to negotiate all the curves and walls of the academy. She helped make me look good on paper when I didn't know what I was doing. She made us all look and sound better than we were sometimes. I wept hard this morning when I heard she had left this earth so soon after her retirement. I never met a finer human being in my life. Rest now Lucy, finally, rest in peace. 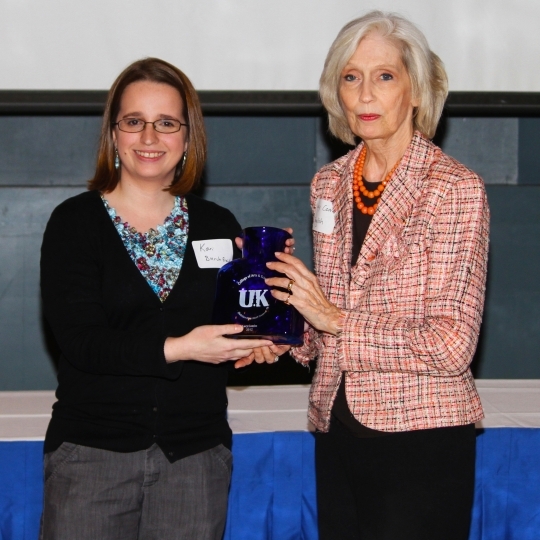 Photo: Lucy receiving the College of Arts & Sciences Outstanding Staff Award in 2012. Such a terrible loss too soon is heartbreaking, but I would really like to celebrate the many years that Lucy made the English Department a better and more joyous place. When I was a new Chairperson (the 9th or perhaps 10th English Chair Lucy had worked with — we lost count), Lucy was unfailingly patient and also generous with her vast storehouse of department knowledge, all while gently pointing me in the right direction when she sensed I was off balance or threatening to charge off in the wrong direction. As Lucy calmly reminded me during one particularly difficult moment, “this isn’t my first rodeo.” We will always fondly remember her sly wit and wry sense of humor, as well as all her other great characteristics — unflappability, kindness, efficiency, sense of decorum — and LOVE of all things chocolate. I first encountered Lucy in the fall of 1971 or 72. I was a very new assistant professor but had been put in charge of arrangements for the A&S Distinguished Professor lecture and reception. Bill Ward was the recipient the year. To get funding for some purple candles I wanted for the reception I was sent to the A&S office of Dean Boyer. There was beautiful Lucy, his secretary, whose poise and cordiality astonished me. I thought my request bordered on the absurd, but although she had never seen me before Lucy treated me with great respect, and I was ushered into the Dean’s office as if I were an important senior faculty member. I last saw Lucy in October, 2011, and was amazed that in appearance she had scarcely changed over the course of 40 years, just as beautiful as she had always been. When Lucy became secretary to the English Department chair I was thrilled because even in my brief experience with her I knew she would be terrific. Department chairs of very different personalities came and went but Lucy was always there keeping the department on track with her graciousness, efficiency, and nice understated sense of humor. Going into her office was to enter a haven of order with aromas of Gevalia coffee brewing (she got me hooked). I mainly visualize her in a beautiful French blue shirtwaist silk dress which was perfect with her lovely blonde hair. But then Lucy had a sense of style in everything she did. As John Clubbe remarked yesterday, “Lucy was always first class.” Even after we retired to Santa Fe Lucy kept us well supplied with department stationery and envelopes and duly forward errant mail to us until the day she retired. All of us who passed through the English Department during her tenure were and are blessed to have known her. Lucy was a sterling example of grace, respect, kindness, and generosity. Her collegiality, hard work, and good humor made her a beloved colleague. She was quick to help, whether by pitching in on projects outside her responsibilities, or by raising our spirits with surprise gifts of chocolate. Lucy was the first contact many visitors had with the university, and we often heard from them later about how friendly she was and how welcome she made them feel. Those of us fortunate to work closely with her for many years know that she made everyone feel welcome on a daily basis, no matter how many tasks she was juggling. As the College of Arts and Sciences develops and promotes the five professional standards—competence, learning, respect, communication, and flexibility—we can look to Lucy Combs as the embodiment of those standards. We will miss her presence, but her influence will live on by the conscientious way we do our work and in the way we treat our colleagues. Lucy's efficiency was legendary, but what I remember most, and most fondly, was her grace. No matter how much pressure she was under, she never ran out of patience or kindness. Visiting speakers and job candidates were always eager to thank her for her help and advice, which included everything from travel arrangements to footwear. English department members -- and especially chairs and former chairs like me -- benefited from her thoughtfulness on a daily basis. She won't be forgotten. Everyone loved Lucy. She was the most organized and trusted member of staff in the Department, probably in the College, and she was patient and kind and a good listener. A lot of people depended on her and I think she had to listen to a lot. I first met her over 25 years ago when I arrived at UK as a young assistant professor. She presented me with a carefully assembled welcome packet of maps, guides, programs and realtor brochures, each item labelled in neat handwriting on yellow post-it notes. The detail and precision which she brought to every task was wonderful. She was administrative assistant and secretary to the department Chair, but in fact she helped everyone, and there was not a single faculty member who was not in her debt. She had great dignity and earned instant respect. Somehow, she was always willing to help. She was smart and hard-working and she knew everything. I haven't been back to Lexington since I left in 2004, but Lucy always kept me up to date when she could. She was a great addition to the English Department, and I will always remember her as one of the bright memories of my time there from 1972-1998. I was shocked and saddened by this news. She was a wonderful, sweet, efficient person to work with. I can't imagine making it through four years without her. She was also Bob Hemenway's administrative assistant before me, and I think Joe Bryant's, who may have stolen her away from Graduate Studies. We kept in touch after I retired. I mourn her passing. My deepest sympathy to Lucy's family and close friends. Lucy was a wonderful person -- so kind, warm, and gracious to all. I feel lucky to have worked with her in the UK English Department for two years. She will be sadly missed. Lucy was superior at her job and at "the rest of life." She was always wise and kind and patient while keeping the show on an often bumpy road. She held the key to my heart…and to the office I could creatively lock myself out of…Yes, peace to you, Lucy, and to the universe that seems less with you gone from us. Our thoughts and prayers are with you and your loved ones. Lucy was a joy to all who knew her. She was gentle, patient, kind and never ever complained. Although I saw her infrequently in Patterson Office Tower, I will miss her smiling face and calming demeanor. Prayers for her family during this very difficult time. Lucy was a gift to us all. Heartfelt condolences to all of Lucy's family and friends now mourning this huge loss.